Please attach your cover letter and resume to your email when applying. The Events Assistant provides support to the Events Department in the planning and implementation of internal and external events. Assist in maintaining the events calendar. Assist in the coordination of logistics for external and internal events. Work collaboratively with vendors and contractors. Maintain internal event requests, paperwork, and modifications. Assist in generating contracts and paperwork for external events. Create invoices and send out payment reminders. Provide support for departmental communications. Able to complete tasks in a timely manner. Follow policies outlined in the Museum Policy and Procedures Manual. Minimum of a college degree or at least two years’ experience in the hospitality industry or a related field. Ability to troubleshoot, problem-solve, and make decisions in the absence of the supervisor. Presence: Ability to maintain a positive attitude. Multi-tasking: Ability to remain flexible and to work on a wide variety of projects simultaneously. Professionalism: Excellent organizational skills with attentiveness to detail. Computer skills: Word processing and spreadsheet experience. Flexible scheduling to include weekends and evenings. TO APPLY: Please send cover letter and resume to camajobs@crockerart.org. To keep the Museum and grounds clean and orderly and systems and equipment working effectively for the comfort and safety of visitors, staff, and collections. Daily cleaning of lavatories, kitchen areas, and public spaces. Scheduled dusting of all spaces. Emptying trash receptacles, daily and/or as needed. Supplying receptacles with paper products where required. Replacing light bulbs as required and tracking replacement needs. Pressure washing exterior spaces, surfaces, and equipment. Cleaning and maintenance of all floor surfaces-rubber, ceramic, wood, and carpet-using handheld and power equipment. Cleaning and maintenance of all wall surfaces, painted and wood. Notifying supervisor of any needed repairs to Museum property or equipment. Notifying supervisor immediately of equipment and supply needs. Set up and clear out spaces in Museum used for various activities and events, in accordance with written and verbal instructions. Place chairs, tables, audiovisual equipment, electrical connections, trash receptacles, etc., in accordance with user requests and in such a way that the space and Museum collection are protected from potential damage. Act as monitor for contractors and others working within the Museum to ensure that they follow appropriate procedures for working in the Museum environment. Protect the Museum from dust, chemical or fumes incursion, temperature variations, and security/safety breaches. Knowledge of materials, methods, tools, and equipment used in cleaning and maintenance. Knowledge of basic safety rules. Willingness to take initiative to identify and solve problems. Ability to communicate well with others, interacting in a positive way to represent the Museum. Ability to work irregular shifts as needed including weekends, holidays, and evenings. The Preparator engages audiences by creating and maintaining dynamic and educational exhibition designs and installations. Collaborate in a team environment to produce superior quality exhibitions. Assist in coordinating temporary installation staff and volunteers. Design and build furniture, platforms, and mounts; in both wood and metal. Assist in planning exhibition flow. Paint galleries and exhibition furniture. Fabricate hanging and mounting systems for works of art. Perform maintenance duties to keep exhibits and displays clean and clearly labeled. Prepare artwork and historical artifacts for shipping; receive and unpack shipments of art objects and other exhibition related materials. Transport art in 26’ moving trucks; knowledge of proper strapping techniques required. While performing the duties of this job, the employee is required to stand and walk for long periods of time; use hands and arms to reach, handle, and feel. The employee must occasionally lift and/or move up to 70 lbs or more. At least three years of professional art installation experience working in an art museum or related institution. Ability to work with new/digital media, such as A/V setup and projection, digital editing, DVD authoring. Ability to multi-task and assume a variety of projects simultaneously. Ability to drive large trucks. Knowledge of art handling, packing, and art-storage techniques. Ability to safely use power tools and other necessary equipment. Ability to solve problems and find attractive and safe solutions to hanging and/or showcasing unusual works of art. Ability to work cooperatively and effectively with staff members, volunteers, and subcontractors. Ability to perform physical work associated with preparation of exhibits. Successful completion of a four-year degree from an accredited college or university in art, commercial art, museum studies, art museum education, or a closely related field. Rigging techniques for large and small objects. Complicated fabrication of wood, metal, or plastic. Familiarity with welding techniques; MIG, TIG. An understanding of the goals and strategies of art museum education. Ability to develop and organize ideas of exhibition design and art presentation and communicate these ideas to the public. Strong design skills and knowledge of a range of aesthetic styles to assure historical appropriateness and compatibility between the exhibition design and the art presented. 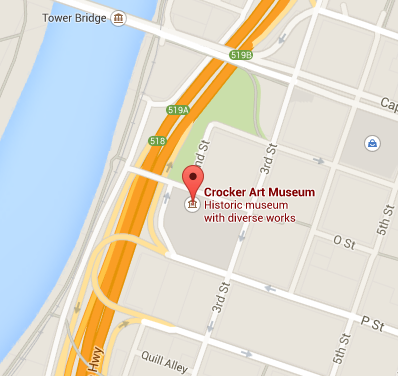 The City of Sacramento is seeking to hire the Associate Curator of Art position at the Crocker Art Museum. Candidates will organize exhibitions, perform professional work related to the permanent collection, and interact with donors and the public. For more information and to apply, please visit https://www.governmentjobs.com/careers/saccity/jobs/2401938/associate-curator-of-art?page=2&pagetype=jobOpportunitiesJobs and click on the Associate Curator of Art position. Under the supervision of the Museum Store Manager, the Museum Store Associate is responsible for providing a high level of customer service while making sales transactions. This position is an essential part of the visitor experience. The focus of the position is to engage with visitors; complete sales transactions; maintain a well-stocked, organized, and attractive sales floor; assist customers with purchases; receive, price, and display merchandise; and sell memberships—while representing the Museum in a positive, friendly, and knowledgeable manner. Maintain a professional and courteous manner at all times. Provide exceptional and authentic customer service. Demonstrate knowledge to assist customers in selections and promote sales and memberships. Demonstrate Museum knowledge regarding current events and exhibits. Conduct and process sales transactions with speed, efficiency, and accuracy on point of sale system. Participate in maintaining an orderly and attractive store and stockroom. Open/close Museum Store and count drawer. Balance cash drawer at the end of the day. Demonstrate an understanding of the store operations, policies, and procedures. Communicate issues effecting customer experience to Museum Store Manager. Must be dependable and enjoy working with the public. Have an interest in art, community, and customer service. Excellent interpersonal and customer service skills with a demonstrated ability to work with diverse audiences and internal customers. Must have retail and customer service experience. Knowledge of computerized registers and point of sale systems. Ability to multitask under pressure between customer, register, and stockroom.